By Noble Education Foundation, Inc. Developer: Noble Education Foundation, Inc. Essential app for Ummah, An application for iPhone, iPad and apple watch. 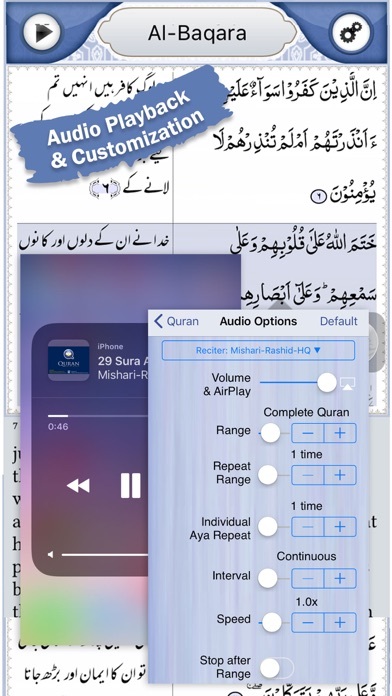 The list of features you can avail for Free: ◉ Complete scalable Quran with all diacritical marks ◉ Side by side English translation by Mufti Taqi Usmani with audio ◉ The beautiful Uthmanic and IndoPak script (fonts) ◉ Complete audio recitation of famous Qari (Sheikh Mishari Rashid) ◉ Bookmarking (up to 3 bookmarks) ◉ Bulk download (for last ten sura only) ◉ Portrait and landscape mode ◉ Scalable font sizes ◉ Sura and Juz index ◉ High-quality audio recitation with ayah highlighting ◉ Pinch/zoom feature for changing the font size ◉ Fast audio playback through robust download method with progress icon ◉ Colored ayah marking to show downloaded audio ◉ The contextual toolbar on double tap ◉ Option to update existing content (for fixing errors in Quran text, translation or audio) ◉ Goto aya feature Complete Arabic text and translation have been proof-read by a Muslim scholar ('alim). Paid version contains many translations, many reciters, English and Urdu translation audio, unlimited bookmarks, background audio, disable standby feature, bulk download & many more features. There were quite a few bugs at first, but have since been worked out. Best app I’ve found for reading Quran. This app is amazingly amazing. My God Bless all those that contributed in developing this app. Thank you so much for adding the Juzz number. I REALLY appreciate apps that are constantly updating themselves. Suggested feature idea: A separate section that identifies dua related ayahs in the Quran. And Possibly add a “playlist” option. I would love to have my morning ayahs bookmarked so i can easily click play and they will play the ayahs throughout the quran in the order i would like them to. thanks to developers for the free good basic version that is also ad-free. Just few thoughts on possibly adding perks like daily duas, prayer times, hadiths and may be helpful self-tracking ideas for everyday supplication and reading in addition to more translations as a suggestion. Also, it would be good to have a tool to jump directly to certain ayah or surah without having to click on the surah title to chose the next surah. there are apps out there that have those in the free versions, with ads though. again, good job! just comments to make it even better. jazakAllahu khayr! 1.Easy to use. 2.Font size is adjustable. 3. You can bookmark and find easily. 4. Choose your favorite reciter. 5. Translation and commentary is available as well. 6. From elder to young anyone can use it with ease. Everyone in my family uses it. May Allaah bless the makers of this app. Highly recommended! Most amazing app I’ve ever used 🔥🔥😋. HIGHLY RECOMMEND ‼️💯 GO GET IT PPL !! More by Noble Education Foundation, Inc.